Bouley at Home, David Bouley's new Flatiron restaurant, offers a "multi-sensory Nine Course Tasting Menu" for $225. Diners can purchase tickets online. There's also a food lab, cooking school and bakery in a space designed by German kitchen design company Bulthaup. Dinner Tues.-Sat. Bouley at Home, 31 W. 21st St., New York, NY 10010, 917-237-3205. Aurora Restaurant Group, the team behind Emporio, Aurora SoHo and Aurora Brooklyn, has a new, modern trattoria called Evelina in Brooklyn's Fort Greene neighborhood. The menu includes dishes like ricotta gnudi with heritage pork sauce, and wood-fired bavette steak. Dinner nightly. Evelina, 211 DeKalb Ave., Brooklyn, NY 11205, 929-298-0209. Chef Tasuku Murakami (Sushi Azabu) helms The Lobster Club, the Japanese-inspired restaurant from Major Food Group, its third in The Seagram Building after The Grill and The Pool. Designer Peter Marino has created a lounge vibe with vibrant colors and a Jackson Pollock-esque splattered tile floor. Lobster will be featured in many dishes, and the menu will also include sashimi, sushi and creative cocktails. The Lobster Club, The Seagram Building, 98 E. 53rd St., New York, NY 10022, 212-375-9001. Chef-restaurateur Danny Brown has transformed his cozy Upper East Side X Bar Bistro into Charc, a wine bar. The new spot serves charcuterie, cheeses and sandwiches, along with wines and cocktails. Charc, 316 E. 84th St., New York, NY 10028, 646-719-1398. Harold Moore (Harold’s Meat + Three) has a new 80-seat restaurant in the West Village called Greenwich Grille, decorated with American flags and other patriotic décor. Expect dishes like chicken potpie and beef stroganoff, plus breakfast burritos and french toast casserole for brunch. Dinner Tues.-Sat., Brunch Sat.-Sun.. Greenwich Grille, 33 Greenwich Ave., New York, NY 10014, 646-609-3615. After five years away from New York City, chef Joël Robuchon has opened tasting restaurant L’Atelier de Joël Robuchon, which has an open kitchen and a focus on small plates. Le Bar de Joël Robuchon with its own menu shares the former Colicchio & Sons space in the Meatpacking District. Dinner nightly. 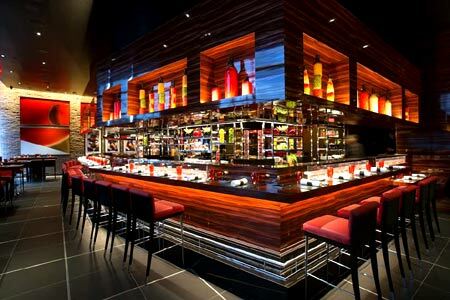 L'Atelier de Joël Robuchon, 85 10th Ave., New York, NY 10011, 212-488-8885. The Osprey is located on the main floor of 1 Hotel Brooklyn Bridge and boasts striking Manhattan views. The executive chef is Michael Oliver and the chef de cuisine is Michael Poiarkoff. In addition to craft cocktails, the restaurant serves dishes cooked in a Rotisol rotisserie, like branzino with new potatoes, olive tapenade and artichokes, and roast chicken with savoy cabbage and parsnips. Dinner nightly. The Osprey, 1 Hotel Brooklyn Bridge, 60 Furman St., Brooklyn, NY 11201, 347-696-2505. The Maccioni family has closed Circo after more than 20 years. They are looking for nearby locations to potentially open a new incarnation of the restaurant. Circo, 120 W. 55th St., New York, NY 10019, 212-265-3636.